Beginning October 1, 2018, prospective securities industry professionals looking to become registered with a firm at the representative level will be required to pass the new Securities Industry Essentials (SIE) exam in addition to a revised representative-level qualification exam. These exams are considered “corequisites” in meeting the exam requirement and obtaining a registration. This means there is no required order in which these exams must be taken or passed. What does the current Series 6 Exam look like? According to FINRA, an individual registered as an investment company and variable contracts product representative is permitted to solicit, purchase, or sell mutual funds, closed-end funds on the initial public offering only, variable annuities, variable life insurance, unit investment trusts, and municipal fund securities. Prior to October 1, 2018 current registration candidates must pass the Series 6 exam by demonstrating they possess the knowledge needed to perform the four main job functions of an investment company and variable contract products representative. Candidates have 135 minutes to answer 100 multiple choice questions, and the exam requires a passing score of 70%. What will the SIE Exam look like? All individuals engaging in the securities business will be required to take the SIE exam as of October 1, 2018 (not just Series 6 candidates). It will assess common securities industry knowledge and general concepts and will focus on industry terminology, securities products, the structure and function of the markets, regulatory agencies and functions, and regulated and prohibited practices. On January 12, FINRA released the exam structure and specifics. Candidates will have 105 minutes to complete the SIE exam’s 75 multiple choice questions. The exam will be scored using a statistical adjustment process known as equating. Equating the scores will consider the slight variations in difficulty among the exam items and allows for a fair comparison of scores so that each candidate will be held to the same passing standard. 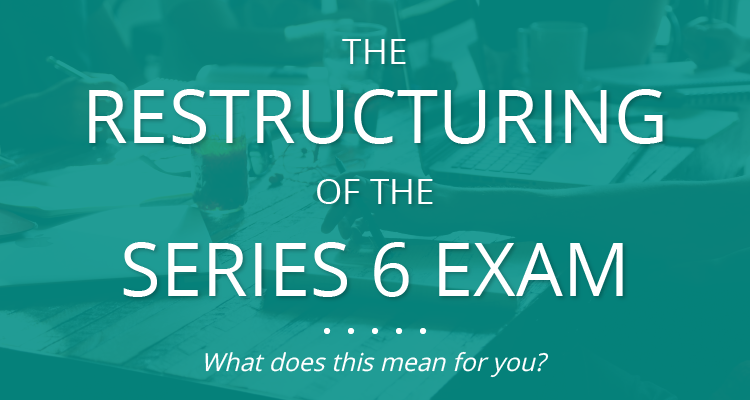 How will the Series 6 Exam be restructured? Because of the new requirement and creation of the SIE exam, the Series 6 representative-level exam is being restructured and will be referred to as a “top-off” exam. With the SIE exam being structured to assess general securities industry knowledge, the restructured Series 6 representative-level exam will have fewer questions and a more in-depth focus on the four main job functions as an investment company and variable contract products representative. FINRA recently released the exam restructure and specifics. The new Series 6 top-off exam will consist of 50 multiple choice questions, allow the candidate 90 minutes to complete the exam, and will be scored using equating. Where can I find exam prep materials for the Series 6 and SIE? A.D. Banker & Company will provide a full line of SIE and the revised Series 6 study materials including an online course, study manual, practice exams, and web classes. Remember to check back with A.D. Banker & Company for updates regarding the SIE and the revised registration-level qualification exams on a regular basis. To speak with someone from A.D. Banker regarding all Securities licensing study programs, please contact us at 1-800-866-2468.